ICICI Bank has ruled as the largest private bank for almost two decades but now its dominance is under serious threat. Rival HDFC Bank is fast catching up and has actually overtaken it in the current fiscal in terms of balance sheet size or total assets. Indeed, HDFC Bank has closed its balance sheet at Rs 7.88 lakh crore in the second quarter of 2016/17 while ICICI Bank was lagging behind at Rs 7.51 crore. It is likely to maintain its lead at the end of the financial year. But Aditya Puri, MD of HDFC Bank, says he doesn't believe in making balance sheet comparisons. His focus in on ensuring that the bank serves its customers better over time. "If in this process, size grows, good for us," he says with a grin, seated comfortably at his fifth floor boardroom at HDFC House in central Mumbai. The bank is reaping the fruits of following a very consistent strategy of pursuing profitable growth right from its inception. Some private banks followed the strategy of aggressive growth first and stumbled in the process. "I will not try and grow size for the sake of growing size. Our size will grow because the demand for our products is growing," says Puri, the longest serving head honcho at any bank in India. The 66-year-old Puri is focused on increasing market share. The bank has emerged as a market leader in credit cards - with 7.1 million card holders - though it was relatively a late entrant in the category. The bank has also scaled up its personal loans portfolio that has the lowest delinquencies in the industry. This at a time when many banks and NBFCs shut their personal loan business or downsized it significantly. The bank is one of the top three players in acquiring merchants and installing POS (point of sale) machines. Of late, the bank is betting big on mPOS (mobile point of sale), a machine connected through mobiles that costs less. At last count, the bank had installed 80,000 mPOS. Be it costs, capital, returns or asset quality, the bank is miles ahead of other banks. In the BT- KPMG Study 2016 , it has won the jury award for Bank of The Year and also emerged as the quantitative winner and fastest growing among the large banks. 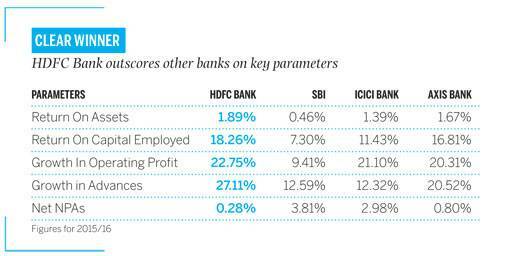 HDFC Bank was also the overall winner last year. Ask Puri about the consistency in the banks performance, and he says , "We want to own the customers by being able to deliver the best product at the best price backed by our trust in a manner most convenient to them." With that end objective, the bank uses technology, data analytics, artificial intelligence, robotics, etc. In its two decade journey, the bank has weathered many economic cycles but it never strayed away from the stated objectives of striking a balance between risk and margin. That is something the bank has proved by growing profitably in the period after 2008 when every other bank has been impacted by the slowdown. Today, the big banks are struggling as credit offtake is low, capital is hard to come by and asset quality is deteriorating rapidly. For many peers, retail banking growth has been a saviour as the corporate loan book is hardly showing any growth. HDFC Bank, however, has been growing its loans, revenues and profits at over 20 per cent in the last and most difficult six-seven years. The quality of portfolio reflects in its NPAs (non performing assets). The bank's net NPA at 0.28 per cent is lower than even its 10 year average. This is unparalleled as other banks, including private sector peers, have amassed huge pile of NPAs in a challenging environment. HDFC Bank has managed to build a well balanced mix between retail and wholesale. Even in wholesale, the bank has smartly built a portfolio of working capital loans, emerging corporate & SME (small and medium enterprises), transaction and investment banking. The retail component comprises half of its total loan book and the bank has a sizeable presence in auto, personal and home loans. The bank's growing market capitalisation (market cap) reflects the way the bank has become the investors' favourite on Dalal Street. In fact, its market cap at Rs 3.07 lakh crore is way ahead of State Bank of India (SBI) and ICICI Bank - two large banks in terms of balance sheet and branch network. SBI and ICICI Bank have a market cap of Rs 1.92 lakh crore and Rs 1.46 lakh crore, respectively. HDFC Bank is now closing in on the largest conglomerate in the country, Reliance Industries Ltd, that has a market cap of Rs 3.45 lakh crore. The big theme for HDFC Bank is digital banking. In fact, post demonetisation, digital transactions of the bank are growing because of cash shortages. In the past few years, the bank has been aggressively using data analytics, artificial intelligence (AI) and software robotics. In fact, the bank has plans to roll out physical robots at branches to help customers make cash deposits, withdrawals, fixed deposits, etc. "Now the customer wants 24x7 access. He wants convenience and the best product at the best price," reasons Puri. AI and robotics is allowing banks to do a lot more analysis (because of computing capacity) for identifying customer segments better and unveiling superior products. Fundamentally, you can analyse a lot more in areas like credit, marketing etc. This helps in understanding of customers and also understanding your own business," says Puri. Unlike banks that solely targeted deposits in semi-urban and rural areas, HDFC Bank is exploring the rural markets both for assets (cattle loan, agri credit, etc.) and liabilities (deposits). The bank has launched innovative solutions through technology, such as milk-to-money ATMs and payment solutions for agri procurement. "Overtime, some serious competition will come from payments and small finance banks. The small finance banks are strong on the lending side because of their micro finance background and payments banks will innovate on payments and transaction space," says Kalpesh Mehta, Partner at Deloitte India. Meanwhile, the disruption is also coming from the regulator's side too. HDFC Bank has its own person-to-merchant digital wallet 'PayZapp' but the recent launch of Unified Payment Interface (UPI) is expected to eliminate digital wallets in the longer run. Experts are divided over their future. Wallets, some believe, will always have utility as customers would not like to expose their bank account directly in an online transaction. Puri isn't bothered too much about the interoperability under the Bharat Bill Payment System (BBPS) - it would make even bill payment services interoperable. "You need a customer base to offer such services," says the ex-Citibanker. But clearly, after the launch of BBPS, there would be fierce price competition among banks to attract customers for such low value transactions.